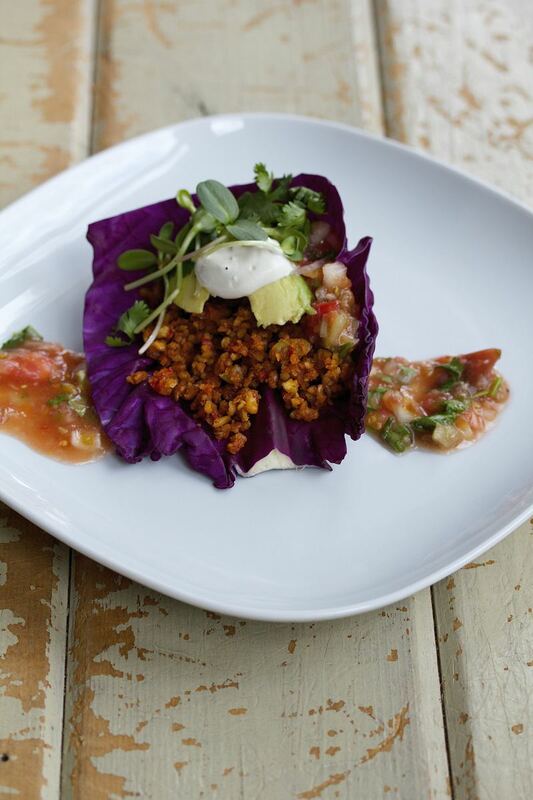 For the picture I layered chorizo first, fresh corn, guacamole, raw sour cream, cilantro and pea sprouts! Blend ingredients well in the blender. Pulse the walnuts and pumpkinseeds together in the for processor until they are crumbly but not powdery. Put nut/ seed mixture into a mixing bowl and mix the rest of the ingredients by hand until well incorporated. Puree all ingredients well until smooth. Chop and mix all ingredients together by hand, or pulse a few times in the food processor. Mash everything together until smooth. 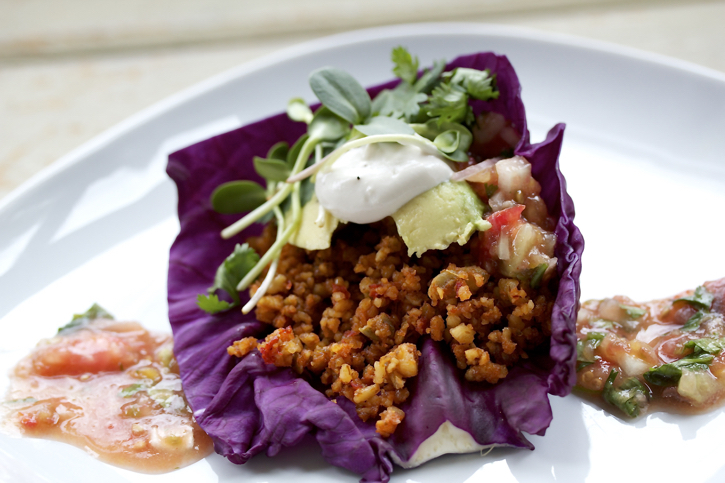 To assemble the taco, carefully remove the outer leaves of the cabbage and discard. Then start to remove leaves carefully to use as the shells. I like to chop off the stem of the cabbage as this helps the leaves separate from the cabbage without tearing. Expect to lose a few leaves in this process as it can be tricky at first. 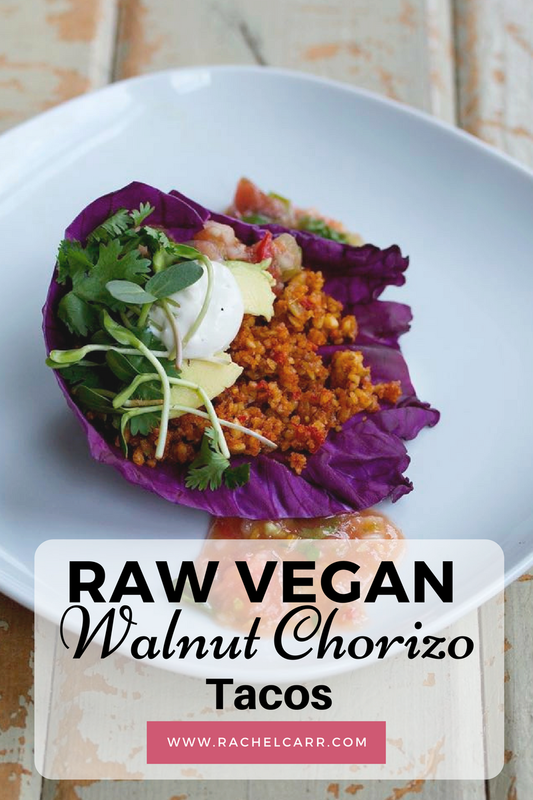 Place some of the chorizo inside the shell and top with the cashew sour cream, guacamole and kiwi salsa. Enjoy! it was delicious! i had lenty guajillo paste left though, any ideas on how to use it? You can keep it refrigerated or frozen and use it in soups, and dressings, or you can use it as a hot sauce! It can be mixed into curries as well instead of chili paste. This vegan meat substitute made with California walnuts is a perfect complement to a breakfast scramble, frittata or breakfast burrito.